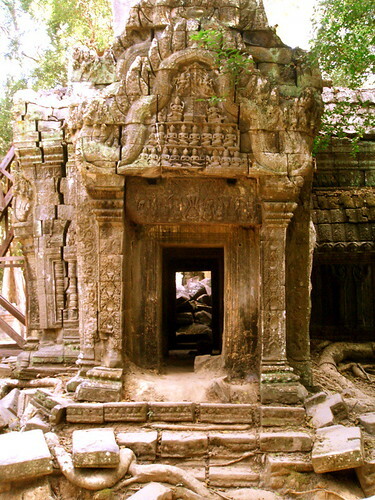 In this post I’ll describe some Khmer architectural elements with accompanying photos of mostly Angkor Wat. By no means is this an exhaustive list of the complex, religio-structural elements of Angkorian design. These are just some aspects that I found especially compelling. 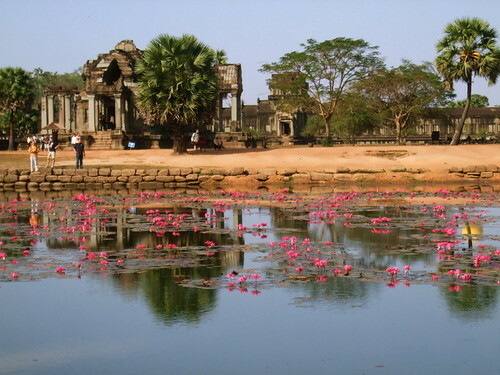 The most common type of Angkorian temple is the temple mountain. 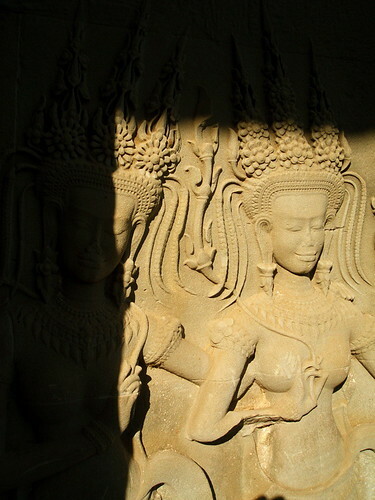 Angkor Wat is the archetype of this style. The basic form of the whole complex is designed to represent Mt. Meru, the mythical mountain where the Hindu gods reside. It’s like the Greek Mt. Olympus, except no one really knows if a Mt. Meru really exists. 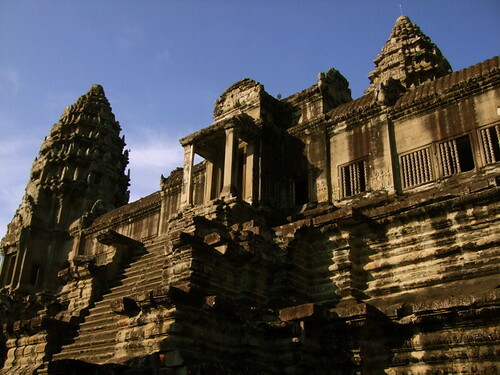 The temples are usually oriented to the east, and are stunning at daybreak. Each temple has three layers of enclosures, with the inner one the tallest, jutting dramatically upwards. 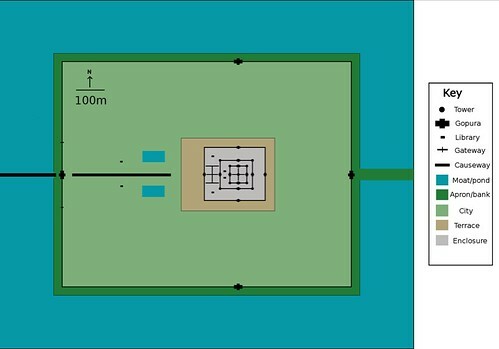 Angkor Wat is surrounded by a moat which is supposed to represent the oceans of the world surrounding Mt. Meru. This seems to be an important theme since every temple has prominent displays of water, whether it be a pond or a moat. Even the barays, the expansive reservoirs, have a temple built in the center of the water. Even within the temples there are smaller pools and ponds. At the entrance of every city or temple are gopuras, beautiful entryways, placed at the four cardinal directions. These are actually buildings unto themselves, sometimes housing a deity at the center. The very largest ones at the city walls are wide enough to drive through, and smaller ones inside the temple are meant for people only. Most of these gopura are capped with towers called prasat. 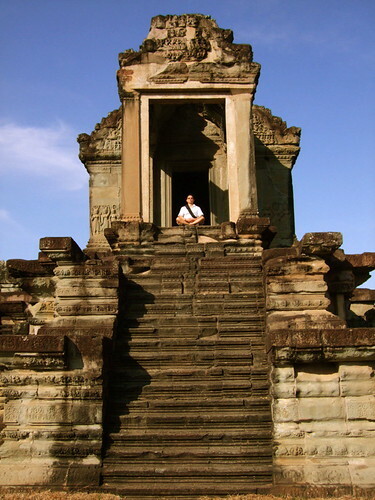 In fact, the prasat is the most ubiquitous element that repeats throughout the complex. The outline of Angkor Wat that you see on the Cambodian flag are the central prasats of Angkor Wat, representing the five peaks of Mt. Meru itself. These five peaks, four at the corners and one in the middle, are called a quincunx, and they house the most important religious relics and have a small opening at the top. 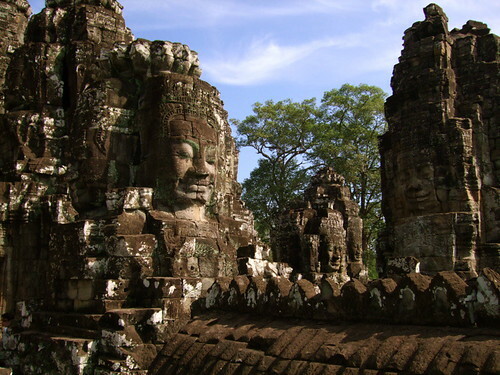 Even though they represent mountains, they resemble the lotus bud, and on Bayon, the towers are adorned with benevolent smiling faces. Throughout the city and inside the temple are pairs of freestanding structures. Apparently these were libraries. I remember seeing similar structures in Thailand. I could imagine studying manuscripts while gazing over the temple grounds from its high platform. Larger freestanding structures inside the temple grounds are commonly described as a hall of dancers. These were different than libraries because they were larger with an open design, and they were roofless, because the roofs were built of wood, which obviously have long ago rotted away. They’re called hall of dancers because of the many pictures of dancers carved into the walls. Since ritual dance is such a part of many religions I wouldn’t be surprised if it really was a space for dancers. Inside the temples, each concentric set of prasats were connected by galleries with columns. Most of these galleries had bas-relief of any number of things, including apsara, or dancing goddesses, narratives from Hindu mythology, and stories lauding the king. Doors and windows generally face the east. But the galleries, walls and prasats are decorated with false doors and windows in the other directions. 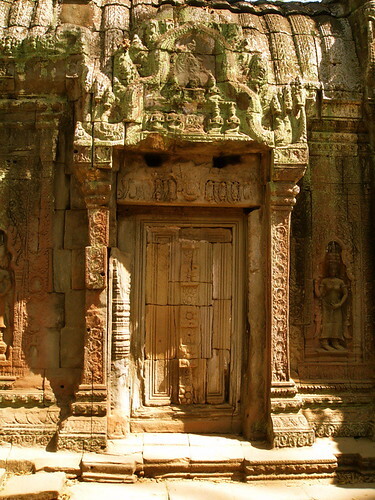 The exception to this is, strangely enough, Angkor Wat, whose true doors and windows are open to the west. And the bas-reliefs also run counter-clockwise, against prevailing norms. Just another mystery for historians to ponder. To enter each enclosure, you have to climb stairs. The central most enclosure has the steepest stairs of all. I wouldn’t be surprised if people fall and get seriously hurt on a regular basis. Depending on the temple, each step can be only half as wide as my foot. Essentially you are rock climbing without a harness and rope. Even when temples were equipped with wooden steps and handrails, it was basically a direct drop to the ground with one missed step. I made the mistake of looking down climbing up a particularly steep temple and I was scared shitless. The central enclosure of Angkor Wat was closed for repairs so I never got to step into the very center of Cambodia. I have enjoyed reading your blog. If you’re interested, I’ve made a couple more videos and posts on Siem Reap and Angkor. Peace. Next Next post: Dr. Martin Luther King Jr.